Sounds European! : To start this interview, we would like to talk about the history of the band. How did you meet? And how did you decide to form the band? What is the history behind the name, Claim? Adrián Riquelme (Claim): In our case, it is hard to know until what point you must look back to try to answer this question – as most of us have known each other for a long time, and we had a band in common back in our busy university days. Afterwards, each of us grabbed our baggage and ended up in a different part of Europe, trying to build a "responsible" future. What happened is that, during all those years when we did not have a band, we kept writing music – probably because of nostalgia or as a mechanism to cope with distance. But as we were gradually returning from our destinations, things happened naturally. Claim has several meanings in English, among them the Spanish "reclamo". This band was a way for us to claim what different situations in our lives (precisely, the crisis) had taken away from us. We had stopped doing together what we liked doing, music. SE! : Both personally and as a group, what artists have marked your relationship with music throughout time? Do you feel they had any influence in the music you perform nowadays? AR: It is funny, because you may be asked what your favorite movies are, what book you have loved lately... but when you are asked about bands that are a reference for you, you must be careful! It is an almost intimate question, a way to define yourself. It should not be answered lightly. Moreover, when you ask this to a musician, all the wires tangle – influences are infinite and the list is neverending. How can you choose among so many? In the end, you say some of the artist you can quickly think of, but please do not take it to heart. 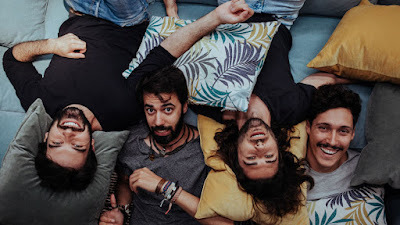 Broadly speaking, Claim takes a lot from American rock sounds like Foals, The National, Dawes or Ryan Adams; from pop artists with fresh, fusion sounds like Paul Simon, Phoenix, Moon Taxi or James Bay. We also have a slight influence from Cuban son, as some of us have been fans of the genre since we visited the island. In my case, I also see an influence from Italian singer-songwriter music – I would lie if I said there is nothing from Franco Battiato or Rino Gaetano in our lyrics. Now you throw that pot-pourri in a mixer and, voilá! Claim. SE! : Even though it is sometimes hard to classify your own music, we know you have a clear view of the genres you develop. Would you tell us what your preception of your own music is? What do you want to express with it? AR: It is hard to label yourself. As you say, music is another means of expression and, generally, you express yourself as you feel like, without worrying about style. But if I had to say in what realm Claim works, I would say between pop and indie. There is a certain reluctance to label yourself as "pop", since it is related to easy music. But we believe pop can be elegant and sophisticated – we believe it is necessary to provide the genre with a little more of depth. In our case, it is the melodies and our work in the riffs, as well as very personal lyrics, which gives value to our songs. SE! : As you say yourselves, the lyrics are a differential in your work. How would you describe your lyrics? What topics do you like to talk about in them? And how is the creative process of your lyrics? AR: Lyrics are the hardest part of a song, because, luckily, Spanish people give it a great deal of importance. There are magnificent lyricists in our country, and that's why, when you try to find something so far unsaid, you must look within yourself and be honest with the paper. In my case, with my job, I don't have much time, so I write a bit every day in my mobile, whatever comes to my mind, whatever I find interesting to tell. Then, at home, I try to find time to shape that idea. We think it's essential to talk about things people can identify themselves with. We like to talk about everyday and current affairs. We like twisting and treating those topics with sarcasm. We like laughing at our own miseries. SE! : Your first work, "Barbados", was released independently. How was the experience of editing your first album yourselves? What were the biggest challenges you faced? And what would you say the biggest lesson you learned from this experience was? AR: Honestly, it has given us much more than we expected. When we decided to record it, many friends recommended us recording a low cost sample and start promoting it, but we knew we had to make something special that surprised people and make them wonder: "Who are these guys?". Almost two years after its release, the album has proved us right, because it allowed us to play in festivals, national radios and reach a broader public than we had thought of, initially. The biggest obstacle is always "the talk", everything related with releasing an album requires money, if you want to do it professionally. At the moment you decide to edit independently, you also have to think how you are going to pay for it, and that draws you to a pseudo-entrepreneurial dynamic that not all musicians are prepared to face. But, in the end, the lesson is always the same: you have no idea of anything, you have a million doubts, you have a lot to improve on. But I like our songs. After all this mess, we have to go on, we trust our job. "We believe pop can be elegant and sophisticated – we believe it is necessary to provide the genre with a little more of depth"
SE! 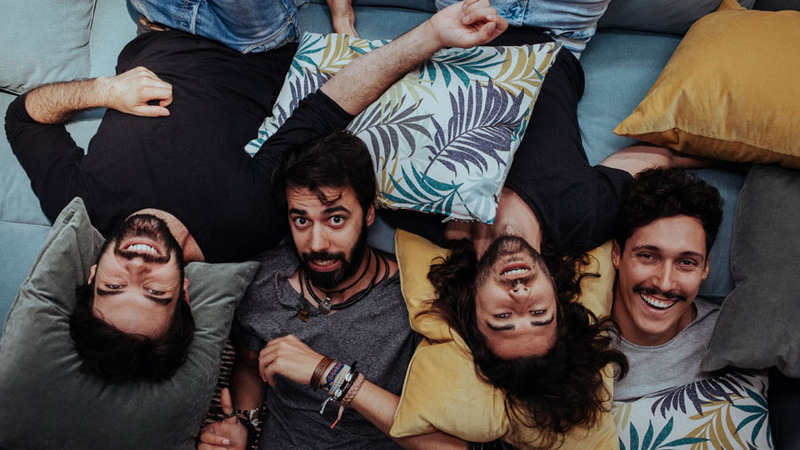 : You have just released a new album, "Sofá paraíso". What can you tell us about it? This time, the album was produced by a recording company (Son Buenos). How is the experience of working with a recording company, when you compare to your previous independent album? AR: "Sofá paraíso" is our first long play album. We have taken it slowly and cared for every detail. It is our "long presentation". We paid attention to each detail and all of our wishes. "Sofá paraíso" is our personal view on modern life within our own context. On the other hand, working with Son Buenos meant climbing one more step in the ladder. They are professionals with a great experience in the market and people trust their word. Many doors have opened just because we have their support. We worked twice as hard, and in a more organized way, and I believe we are making a great team. SE! : We know some of the members of Claim are architects. Do you feel this has any influence in the work with the band (as, for instance, in the so distinctive design of your graphics, in the way of "building" a song, etc.)? How do you combine both professions? AR: Hahaha, yes, there are three architects in the band. And let's say that, after some time, we discovered that the creative process in architechture and the one in music are very different in the beginning, yet very similar at the end. I mean, when you build something, you usually do it for a certain person or entity, with very defined schemes and needs. You need to make your creative skills available for a person who wants to live in a specific way. However, in music, there is no defined "client". Someone might say "your fans", but this is naturally a very broad spectrum. Fans expect new things from you. Fans trust you and want you to keep making songs. In short, in music, you are your own client. Regarding the end of the process, both are tedious and workful. You need to be extremely detailed and perfectionist. SE! : With the new album in the market, what can we expect from the near future of the band? What are your next projects? AR: As Brian May would say, what a band does, new songs and touring. And actually, we hope so – that would mean there is Claim for a long time. Right now, we are only thinking about taking this album (in which we believe so much) to the most people we can. That is the hardest thing of them all, to have an audience take five minutes to meet you in a world with infinite music offer. Besides this, the only thing we should be worried about right now is having good live performances and having a good time on stage. SE! : If you could choose anyone, who would be some Spanish and international artists you would like to collaborate with? AR: Mother of God, all of them. Claim is so little right now, that we could learn from anybody. Now, if we start dreaming, I would say that, in Spain, we would love to work with Santos & Fluren. And, internationally, I would love to make a song with Alt-J and to be featured in a song by Matt Berninger [The National]. We were allowed to dream, right? SE! : We would like to finish this interview with a song of yours. What is your favorite song by Claim, and why? AR: This question is a betrayal! Hahaha. You know that musicians think that songs are like our little children. It is impossible to choose one. But since we have to be unfair with the other songs, in my case I would say that "Sofá paraíso" is a song that has had a great impact on us since the beginning. From the very beginning, we have agreed on everything – structure, lyrics, arrangements and melodies. We are very happy with it.